After all the Holiday excesses and sleepless nights, it is time to heal and rejuvenate the skin. I have been using Benton's Snail Bee High Content range - firstly, it contains neither dead snails, mucus/bogey, urine nor crushed bees. The "snail mucin" in question is the lubricant that the gastropods secret from their legs as they glide around. I have a scary story about snails further below. My other favourite Korean brands, Mizon and CosRx, have provided documentation saying they do not harm the snails while collecting the lubricant. Benton say they have been certified cruelty-free. Although I had heard a lot about Benton, I was put off by some mentions of the smell - it was supposed to smell like something I won't mention here - because you are going to puke and then call me names afterwards. To add to my apprehensions, I had heard horror stories about product contamination about two years ago. But I received a couple of samples and opened them - there was no smell! Neither pleasant, nor unpleasant. I bought the lot pronto in November, and here are my thoughts. 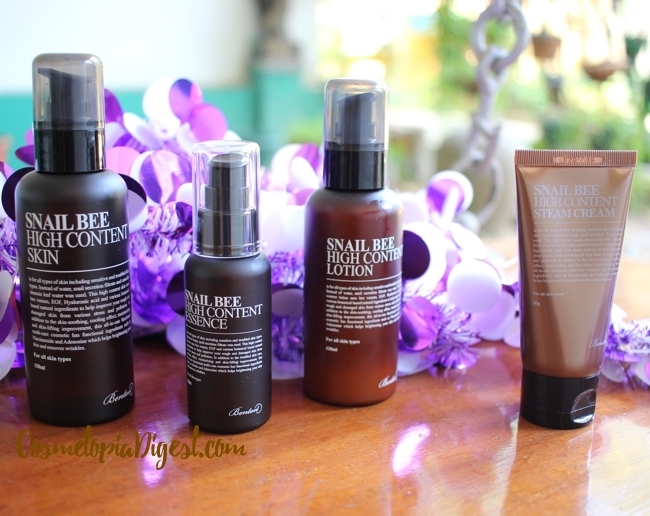 Scroll down for my post-Holiday skincare routine with Benton Snail Bee High Content Skin, Essence, Lotion and Steam Cream. There are different kinds of snails. We had an attack of Giant African meningitis-causing Land Snails a few years ago (stowaways from a ship), and because the meningitis was spreading among non-vaccinated people, the City Corporation decided to cull the snails by using salt, as there were just two many snails to capture. We had to add a thin ring of salt around the home, and the next morning, there was a bunch of dead snails with tonnes of goo - which no one could touch because of the meningitis scare, so Corporation workers came to collect the lot. Sad, but, as the Mayor said, they were spreading disease, like mosquitoes. I'm presuming that mucin from Giant African Land Snails is never used for skincare - or in cuisine, because of the meningitis factor. Snail mucin contains glycolic acid, copper peptides, collagen, elastin, glycoprotein, proteoglycans, copper peptides, iron, manganese, zinc, and antimicrobials. Because these are mostly in trace amounts, the secretion is then filtered several times so the percentage goes up. As I said, it is from the legs. 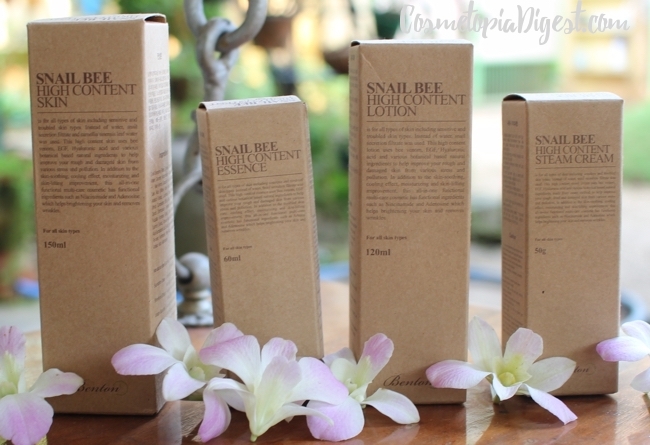 The snail bee range contains snail filtrate and camellia sinensis leaf (aloe vera) water in lieu of an aqueous base. Apart from those two, they also contain hyaluronic acid, EGF (epidermal growth factor), niacinamide, adenosine, bee venom (apparently collected via sound or electric stimulation, without harming the bees), and a host of other skin goodies. My derm has been telling me about PRP for acne scarring - it contains EGF - so I'm pleased to know there are skincare products which contain EGF, though I suppose PRP penetrates deeper into the skin, unlike topical applications. Other ingredients in this range include Human Oligopeptide-1, Beta-Glucan, Betaine, Adenosine, Panthenol, Allantoin, and Arginine. Benton products are free of parabens, mineral oil, alcohol, benzophenone, chemical preservatives, artificial fragrance, artificial coloring, and steroids. While I like the brown plastic pump bottles, the external packaging is, in one word, uninspired. And that's me being charitable. Whoever thought that look was a good idea? I mean, Mizon matches the external packaging to the colour theme of whatever is inside. CosRx gives a nice pharmaceutical look to their products. Benton goes in for meh cardboard boxes. I do, however, love that the sizes of the bottles are far larger than the standard 30ml. This is a very runny toner. I tried the cotton-pad method, but found I was losing product. Now, I dispense two pumps into my palm and pat it all over with my fingers. Once the above product sinks in. This is a thicker, viscous gel which becomes runny when you apply it on the skin. It contains 90% snail mucin. I use just the one pump for the entire face. I then follow with a serum or ampoule, and then wait for a few minutes. This goes on right above serum. I try to sandwich a mist in there as well, because you can never have too much hydration - it all depends on my time, mood, and fatigue. The lotion is more like a lightweight cream. It disperses quickly and sinks in nicely, giving a smoother look instantly. Above this, I apply a lightweight facial oil - either Pai Rosehip or Sunday Riley Luna right now. Optional. Sometimes, I seal it all in with this. At other times, I prefer a proper overnight sleeping pack. More often than not, I use the latter, and haven't been making a dent in the Steam Cream. So what do these products do? It is a comprehensive routine - apart from cleansing and exfoliation - that provides hydration, nourishment, softening, reduction of photo damage, and, thanks to the snail mucin, acne scar reduction. I use these combined with Dr Dennis Gross Alpha-Beta pads, or a similar strong peel. The redness goes down almost at once when I apply the Benton Skin. I would be happier with the addition of a sleeping pack, because there are days when my skin feels like it needs a little more hydration - particularly if I have used a retinol- or ferulic acid-based exfoliant earlier. Toner: Benton Snail Bee High Content Skin. Essence: Three-way tie between Benton Essence, CosRx Snail 96 Essence, and Mizon Snail All In One Cream (which is actually a whipped essence). I CANNOT choose one. Sorry. This is probably because all three contain above 90% snail filtrate. Serum: Mizon Snail Repair Ex Ampoule is the clear winner. Probably my all-time favourite snail product. Moisturising cream: CosRx Snail 92 All-in-One Cream. A close second is the Mizon Snail Repair Gel, which is super-cheap, at just $5 a tube (30ml). But the former is a tad more hydrating. Mizon also has a snail-based sleeping pack, but because the other brands don't have one, I can't compare. My favourite product in the Benton range is probably the essence, closely followed by the lotion. If you are making your first foray into K-beauty, start with this range. It is comprehensive, and you get very good value for money. Prices range from $17 (Essence and Lotion) to $20 (Skin). I pick these up mostly from W2Beauty - they ship worldwide tracked at just $2.50 no matter how much you buy, and include a tonne of samples with purchase! 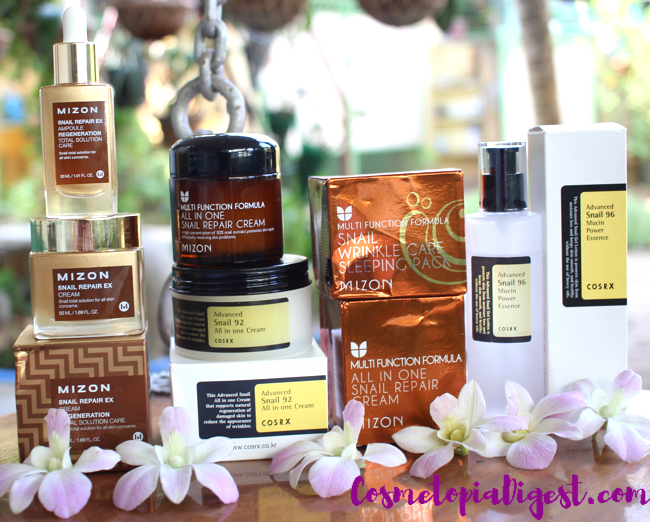 Do you like Korean skincare? Ever tried "snail"? Or are you put off by the thought? Tell me in the Disqus comments widget below.